Relax in our 20' x 40' private pool, salt system! Our bright, modern kitchen is ready for your family! Kitchen island -- there's a breakfast table, too. Nearby, beautiful Long Point Beach! R/T CAR FERRY RESERVATIONS to transfer at cost, week of 7/13. Convenient times; NO STRESS!! NO STRESS; NO HASSLE; DRIVE ON AND OFF MV: Call/contact us now to grab your sweet MV vacation -- WE HAVE CAR FERRY RESERVATIONS TO TRANSFER TO YOU AT COST for the weeks of 7/13/19!! Spend a relaxing week on Martha's Vineyard in our spacious Edgartown home, complete with a private pool and a/c, The island will be tranquil and idyllic. You will feel refreshed and worry-free, particularly because we have car ferry reservations we can transfer to you, at cost, for your Saturday transfers on and off the island. CONTACT US NOW. Our new, spacious, sunny colonial-style home, packed with amenities, offers the perfect, deluxe Vineyard vacation. 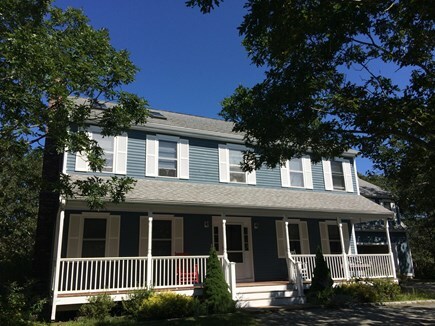 We are located on 1.1 green acres, completely fenced in and lovingly landscaped for total visual privacy, just steps from the State Forest bike path, Martha's Vineyard public bus routes for easy access to town and 1.5 miles from Long Point Beach. Enjoy our private, spacious 20'X 40' pool, with a salt system, for a chlorine-free, refreshing swimming experience. Relax on our substantial, furnished backyard deck. There's free, business-grade Wifi throughout the property. Listen and enjoy your favorite music through the house, deck and pool area with our Sonos sound system. Inside, on the first floor, we have a huge, modern kitchen, dining room, living room with large flat-screen TV and DVD player, and a half bath. Our huge kitchen is the heart of our home, with white Corian countertops, maple cabinetry, new appliances (refrigerator with icemaker, gas stove, dishwasher and microwave), a center island and breakfast table for plenty of seating. There's a large living room with a large, flat-screen TV and DVD/VCR, game table and books, a ''formal'' dining room, ''mud room'' entrance foyer and half bathroom. Our basement level boasts a beautifully finished, meticulously clean basement playroom with ping pong table, toys and games and a full-sized washer and dryer, with a folding counter and hanging rod. Our four, second-floor bedrooms include a master suite with a king-sized bed, spacious walk-in closet, large, flat-screen TV, and large en suite bathroom. 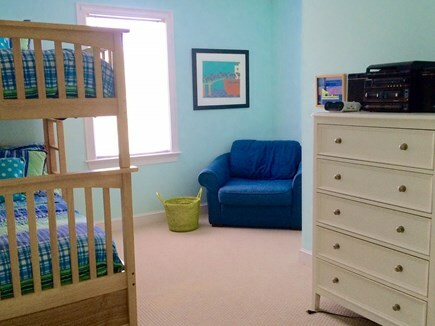 The remaining three bedrooms include a ''bunk'' bedroom with twin bunk beds (2), a queen bedroom (the ''pink'' room) and another queen bedroom (the ''blue'' bedroom). Relax on our front farmer's porch, with a charming swing and rocker. Don't forget to bring your Ipod, laptop, favorite CDs and bath & beach towels (sheets provided, but not towels). Superb -- my new Vineyard stay! We're thrilled you enjoyed your stay, and we are looking forward to welcoming you back! Many thanks for your review. Great house. Very clean, spacious, great kitchen for cooking. All amenities you may need. Great location, middle of island. Nice pool. Would rent again. We were a family group of 6 adults and 4 children, ages 10 months to 5 years. The well maintained home was just right for us and lived up to its description! The private pool and yard are fantastic and the location is also terrific, right in the middle of the island, and easy to get everywhere. The owners truly care and were constantly in contact with us to make sure everything was as it should be. We would definitely consider returning and highly recommend this vacation home! We fell in love with each other -- and Martha's Vineyard -- in summer 1990. We returned for vacation every summer thereafter, to various rentals. Over the years, we found rentals challenging. Some properties were lovely, but others had ''issues'': broken grills, splinter-y decks, torn screens, moldy shower curtains, slow internet or weren't conveniently located. Sometimes, a rental would ''start out great,'' and then would run downhill the next summer. Or the owners or caretakers were unreachable or non-responsive to house issues. So: when we ''dared to dream'' of owning our own Martha's Vineyard vacation home, we fell head-over-heels in love -- again -- with our private, spacious property and our mid-island location, which is extremely convenient to beautiful beaches, the State Forest Bike Path, town and shopping. We happily customized our property to our specifications: our home is well-maintained, constantly updated and meticulously clean. We are service-oriented, responsive owners: we, or our experienced caretaker, a longtime MV resident, will promptly handle any issue that may arise. 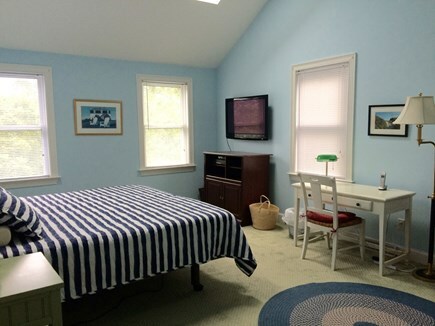 We provide our renters with detailed information about our home, as well as our ''insider's'' updated vacation tips (e.g., restaurants, beaches, activities), so no worries if you are new to MV or are a ''returner'' yourself. We promise: when you arrive at our home and walk through our doorway, you WILL feel thrilled, happy and comfortable -- and right at home! Cheers. Our wonderful property is an oasis unto itself: set back from a convenient, paved road, our home offers visual privacy and quiet. Think of your family or friends splashing in our large, refreshing, private 40' x 20' swimming pool with a salt system (no chlorine irritation or smell) and outdoor shower and private changing area, relaxing on our back deck or by the pool with your Ipad or book (we have business-grade WiFi for your pleasure), and listening to your favorite music on our Sonos sound system, or enjoying the front porch swing and rocking chairs. Think of the fresh, delicious summer meals you'll have -- our Weber gas grill is state-of-the-art and brand new -- while dining on the deck, in the shade or under the stars, or in our bright, spacious kitchen or dining room. Or, hop on a bike, and pedal to the State Forest Bike Path, Morning Glory Farm or into town, or take the convenient VTA bus at the corner of our street when you don't feel like driving. You'll sleep peacefully in our beds (there's a king in the master bedroom; two bedrooms each with a queen-sized bed and a bunk bedroom with two twins; our bathrooms are clean and fresh. You'll wake up to the sounds of chirping birds and rustling trees. Later, you'll have spirited ping pong tournaments in our bright, basement playroom, and there's a large washer and dryer, with a folding shelf and hanging rod, for all those bathing suits and beach towels. Grab a book or a game (we have plenty). Enjoy your stay! One of the (many) reasons we love our home is our convenient, mid-island location. It was important to us to be located on a private, but paved road, so we -- and our renters -- may enjoy a walk, a jog, or a bike ride alone or with family, without dust kicked up from passing cars. Our property is extremely private, with a circular drive for easy ingress and egress, and plenty of space for parking. The nearby and beautiful State Forest Bike Path is extremely convenient for exercising and for biking to Morning Glory Farm, Edgartown Village, or Oak Bluffs. We are a quick and easy drive to spectacular beaches (Long Point, Katama and State Beach), Vineyard Haven, shopping (groceries, as well as shops), restaurants, tennis, playgrounds and recreational areas, and the beauty and charm of Up Island (the sunset at Menemsha Dock, West Tisbury, with Allie's, the Farmer's Market and 7A, and Aquinnah). The island is truly at your fingertips. We provide our renters with detailed, updated information about everything you'll want to know -- and do -- on Martha's Vineyard. So, relax and feel like an insider -- even if this is your first trip to the Vineyard. We know you will fall in love, just as we did, and we'll be happy to welcome you and your family and friends when you wish to return!